Like anything technical, how a cleanroom works is essentially basic, but wrapped up in a whole lot of jargon, standards, rules and regulations. The basic principles are actually perfectly understandable, but you have to claw your way through a lot of irrelevance, myths and misinformation to find something that makes sense. So here is my attempt to do this for you. Cleanrooms do not eliminate contamination altogether. They control it to an acceptable level. How do they do this? The way the cleanroom is operated. Each of the three things above are as important as the other. Let’s look at them in more detail. This means that a painted wall is better than a bare brick wall; a stainless steel bench is better than a wooden one. Cleanrooms need a lot of air. As a general rule of thumb, the cleaner the cleanroom needs to be, the more air it will need to use. Air handling systems are designed to circulate air through the room, removing contamination as air is generated and keeping the temperature and humidity stable. Particles (contamination) in the air tend to either float around or slowly settle to the ground, depending on how big they are. The air handling system delivers air into the room in such a way that it captures any particles and sweeps them out of the room. The air taken out of the room and is usually recirculated through the air handling system where filters remove the contamination. Typically, the air is then recycled back into the room. The amount of air we put into the room is important as well. As I noted earlier, generally the cleaner the cleanroom the more clean air you will need to put in. The more air that goes in, the faster the room cleans itself. This can be important for rooms that occasionally experience high amounts of contamination, or something like a sampling room or dispensary where the room needs to be cleaned quickly between operations. So, as the amount of air introduced into a cleanroom is tightly controlled, so is the amount of air that is taken out. Generally cleanrooms are pressurized, which is achieved by taking out slightly less air than is put in. The extra air then leaks out under the door or through the tiny cracks or gaps that are inevitably in any cleanroom. As a rule, within a facility the area you need to be the cleanest operates at the highest pressure. The flow of air out of the cleanroom helps to stop any external contamination from getting in. A good air handling system makes sure that air is kept moving throughout the cleanroom. The properly locating of where the air is brought in and taken out is the key to good cleanroom design. The location of the supply and return air should take the highest priority when laying out the room. regular monitoring of the filters and air flows and frequent recertification of the cleanroom. Up to now, I have tried to avoid jargon to aid your understanding of the basic concepts of cleanrooms. Now, here are a few words and acronyms that you can drop into your next conversation with your engineering colleagues. This refers to the number of times the air is changed within a cleanroom. It is simply calculated by taking the total volume of air introduced into the cleanroom over an hour and dividing it by the volume of the room. What HEPA stands for is not important, but it is one of the most important elements of a cleanroom. They are large, box shaped filters that remove contamination very efficiently, but they take quite a bit of energy to push the air through them. They must also be monitored and tested regularly to make sure they are still integral. DOP testing or integrity testing is a testing procedure to ensure that a HEPA filter has no holes and is properly sealed in its frame. A micron is a millionth of a metre. A human hair is around 100 microns thick. Bacteria are 1 or 2 microns wide. Particles less than 50 microns cannot be seen by a naked eye. An airlock is a room where personnel, materials or equipment are transferred to a cleaner environment. It can be the size of a small box, through to a large room where personnel change into and out of cleanroom garments. This refers to the level of cleanroom cleanliness based on a number of particles of a certain size per cubic metre. ISO 8 is the base cleanroom level. 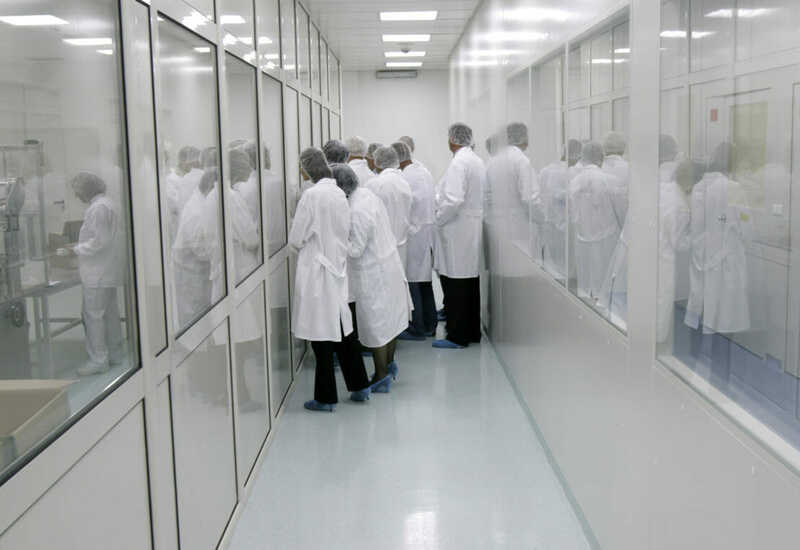 A sterile cleanroom for the pharmaceutical industry will need to achieve ISO 5. Classes above ISO 5 are generally only required for the electronics industry. Grades A through to D refer to cleanroom cleanliness for the Pharmaceutical Industry for European, Australian and some Asian countries. Grade A is the cleanest, for sterile operations, through to Grade D for packing or support operations. These Grades can be related to the ISO Classes. The time it takes from a contamination event to the room regaining its designed cleanliness level. A test that samples a fixed volume of air and captures, filters and counts particles by their size. This is performed when the cleanroom is “at rest” or “in operation”. For pharmaceutical operations, both viable (alive) and non-viable (not alive) particle counts are performed. This is performed as part of the certification of a cleanroom and during regular environmental monitoring. What is your clean room costing you? Optimising your clean room – getting QA buy in to down time. Now you know it all – take the clean room quiz! A very basic, but pretty good layman’s explanation of a cleanroom. Nice job Andrew, although I get the impression that you are not really a layman.